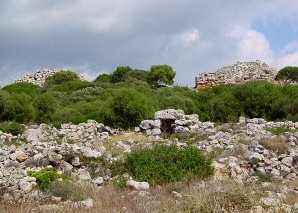 The Torre d'en Galmés Talayotic Settlement is one of the biggest archaeological sites in the Balearic Islands. Situated on the top of a hill, from where you can see a good part of the South coast of Menorca and on clear days even the mountains of Mallorca, it is accessible following a two kilometre road, that can be found to the left of the road that goes from Alaior to the Son Bou beach. The Settlement has a public part formed by three talayots, situated on the top of the hill, a strategic location for controlling the territory. The Settlement also includes a sanctuary called "taula" and private buildings consisting of more or less circular dwellings dedicated to domestic life. Under the hill, you will find a hypostyle or hall with columns, possibly used as storehouses or even as extensions of the dwellings. The storage and filtration system for the rainwater, consisting of a number of cavities and channels that conducted the water to bigger deposits, is another important characteristic of the Settlement. In the Summer, the visiting times are Tuesday to Sunday from 10 a.m. to 2 p.m. and from 5 to 8 p.m. Closed on Mondays and festivities. Tickets: 2,40 euros. In the winter the entrance is free.